Grant Vaughan's current designs explore the interplay of separate forms: creating pieces that go beyond the vessel aesthetic without abandoning the fluidity and sensuality that is the signature of his work. The work is carved from Australian timbers known for their fine grain and stability. Vaughan has exhibited widely in Australia and the USA with pieces in many private and public collections including the Detroit Institute of Arts, Parliament House Art Collection, Canberra ACT and the National Gallery of Australia. 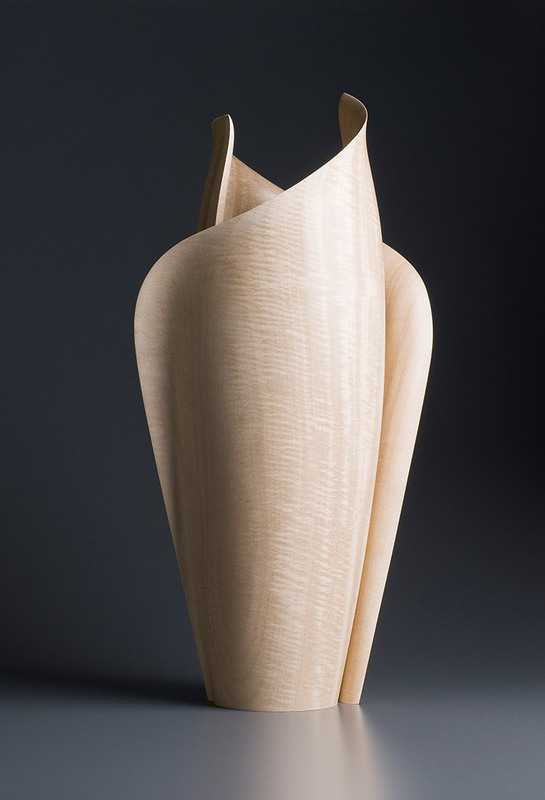 "The work shows Grant Vaughan's characteristic use of sweeping and tight curves, held in check with precisely shaped curled rims and subtle carving into the body of the form. The flawless finish and organic design hint at the forms of natural objects, but it avoids obvious imitation, instead offering an impression of growth in celebration of the unadorned grain of the wood. To find this form in a block of wood requires an experienced eye and hands that can articulate a disciplined reductive process. Vaughan's experience and knowledge of the properties and performance of his chosen material allows him to predict how it will perform both in the shape he plans and after it leaves his control, exposed and responsive again to the natural elements." Excerpt from Transformations: the language of craft.